Our pumps are reliable and functional thanks to the high quality of production. The pumps meet all demands and requirements and offer cost and quality. The mono pumps have a single outlet and propel the water to the front or rear windscreen. Two pumps are needed to propel the liquid to both windscreens. The dual pumps can propel the fluid in two directions. Using a single pump, the fluid is pumped through one of the outlets to the front and rear windscreens. 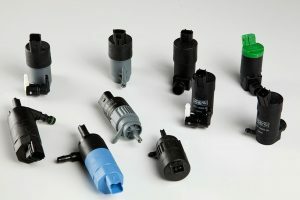 The smart pumps are cycled electronic pumps, carrying out all the phases of the function in the pump itself, without the need for external control. The headlamp washer pumps are made for use with the low-flow headlight cleaner dispensers.